Further to my article "Taking photographs of hand made products to sell on-line" which also appears in the blog, I thought that I'd show my own table top lighting set up. Please see the supplementary blog I've written on some later features I added to my lighting diffuser to make it more practical. 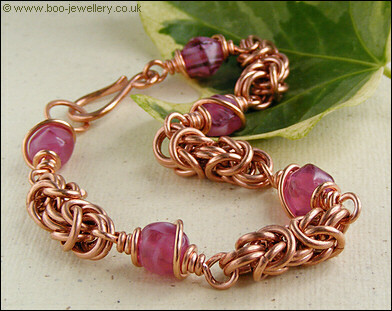 As a keen photographer of long standing, I have spent an inordinate amount of time trying to settle on a style for my jewellery photographs - I've tried all manner of approaches and used every piece of kit at my disposal - every conceivable combination of lighting and all the various permutations of camera and lens. 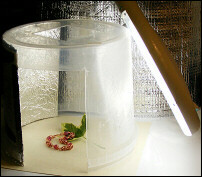 The photographs above show the diffuser both in use with the lamp lit and without to show the outside a little better. You can see how even the light is inside the bucket around the subject. The diffuser has a hole in the side and one in the base/top for flat overhead shots. The reflector behind the lamp is purely because I have a large roll of kitchen paper on my workbench with a bright red label and this prevents it casting colour in my work area. Of course, I was just over-complicating matters. Just because I have access to professional quality equipment doesn't necessarily mean that it's the best tool for the job. 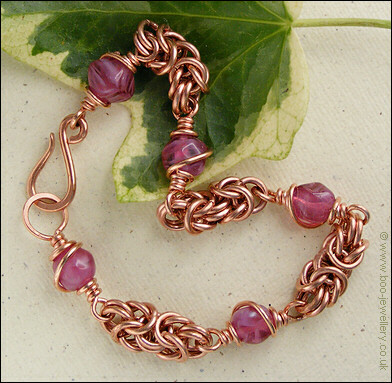 I needed to be able to take photographs, process them quickly and get them on-line so that the object might sell. I don't want to spend any longer doing that than absolutely necessary and I don't want to allocate any more of my already inadequate working space to studio lighting, clamps, cables and tripods. And I certainly don't want a set up that I need to remove in order to continue working. As a consequence, my approach has gradually been simplified over the months until I've finally settled on a workflow that can't really be simplified any further. I don't need to set anything up to take photos, I'm utilising equipment already in place. I'm delighted with the results, but unhappy that I went to such a tortuous route to go full circle. I even now use one of my compact cameras as I love the working perspective and freedom of movement this gives me. Clamped on my work bench I have an inexpensive angle poise magnifier with its own lamp. The lamp is a daylight fluorescent tube that encircles the magnifier. 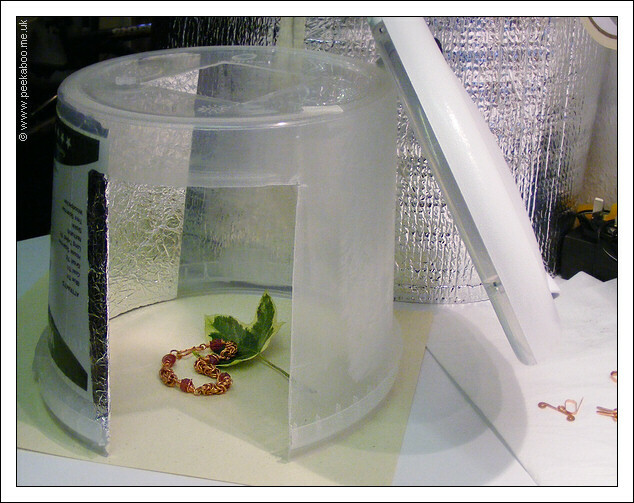 There's a hinged cover for the magnifier to allow the lamp to be used in isolation. I use both regularly when working. The circular tube provides a good diffuse and surrounding light in itself and I use it often as my photography light source on its own. I've found it gives out enough light to secure good enough shutter speeds to work entirely hand-held with the camera, eliminating yet another potential complication. 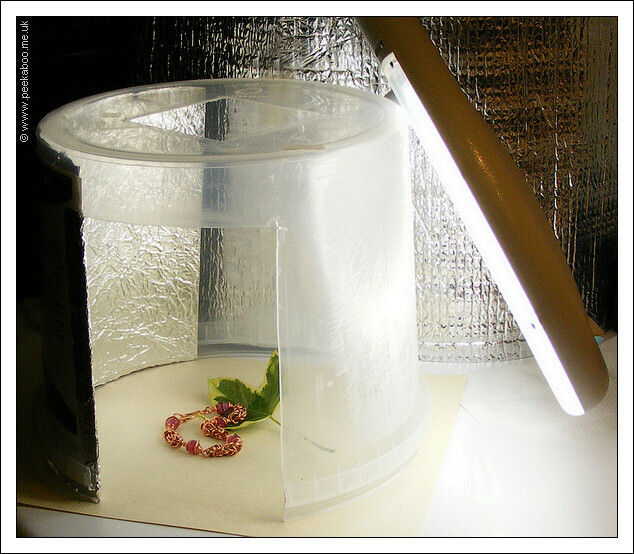 But I also supplement my ring light with a very simple diffuser that cost me nothing - well, I used things I had to hand, they cost something originally - maybe you can scrounge or up-cycle if you don't have appropriate makings to hand. 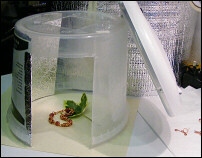 The basis of the diffuser is a translucent bucket, that originally had a lid and handle. It contained fat balls for my garden birds. I've accumulated many of these over the years and was happy to put one to a good use. My bucket is visually white/clear - be very mindful of anything that appears to have any colour cast to it, it may create more problems than it solves. If the sides are slightly tapered to the base, all the better, as this will direct light, especially from the reflector, down onto your subject. 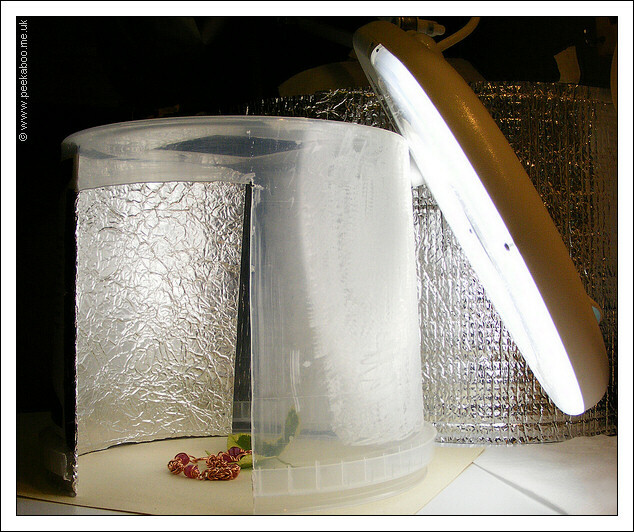 The principle of this diffuser in practice is that you light it from one side and by lining the opposite with a reflector, the light is reflected back too, so you get a good area of coverage with just one light, as you'll see in the results below. I removed the handle and lid, they're not needed, although you may be able to make use of the lid as another diffuser, depending on its transparency, or otherwise. I cut a panel out of one side of the bucket - from the rim, almost to the base - which will actually become the top, as its used upside down. You need it wide enough to allow you to use the camera through this area and be able to move about for framing etc. As you're cutting, take care, if you use a rotary tool with a cutting blade as I did, it tends to melt the plastic a little as you cut which leaves sharp pieces of swarf around the cut surfaces. I trimmed these off and sanded the edges with a coarse grit of wet and dry. If you're using a craft knife, equally tread with caution. On my bucket, it had a printed label stuck onto the side, so I didn't bother removing this, as I knew I'd be sticking a reflector to one side. So I cut my access slot to the side of this. I then scrunched some aluminium kitchen foil and then opened it back out again and burnished it flat and stuck this to about half of the inside of the bucket - shiny side out. You could continue into the base if you want too. By scrunching the foil it scatters light nicely and doesn't cause undesirable reflections. I also cut a hole in the base/top of my bucket to allow me to take overhead shots too. It doesn't compromise the lighting effect enough to notice and you can also place a reflector over this area if required, or sometimes a square of black paper can be useful if you're getting too much light reflected off shiny surfaces. I also decided that it was perhaps too clear and might not diffuse and spread the light enough, so I went over the outer surface on the light side with a sanding tool to make the surface more frosted. On another larger bucket I made too, the plastic was too clear and I lined the light side of that bucket with tracing paper. How much to diffuse the light? You want to diffuse the light enough from the light side to soften any harsh shadows from the uni-directional and close-proximity lighting and to prevent unwanted reflections from anything outside the bucket. The further away a light source is from a diffusing layer, the softer the light, so a light very close to the diffuser as in this case, can still cause quite distinct shadows. If you diffuse the light too much, you can remove all of the shadows and this can sometimes lead to light that is too flat and removes form and shape from your subject. So you want to remove harsh hard-line shadows that distract from your subject and hide detail, but leave enough soft shadow to make your subjects look natural and three dimensional. A bit of trial and error may be required. The beauty for me of the bucket arrangement is that you can set up your scene, lighting and camera, then just lift the bucket over your scene when ready. I personally find this much, much easier than trying to wrangle the subject - especially small ones - inside a light tent or diffuser where the subject sits on the base of the unit and you maybe don't have sufficient space for your hands to manoeuvre. 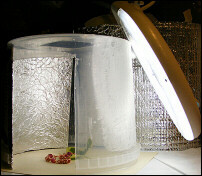 All you need to do now is to place a light source at the side of the bucket . . . sorry . . . diffuser . . . opposite the foil/reflector and adjust positions to taste. You can potentially use any light source - but be mindful of the colour cast of your lighting - and now your diffuser might change it slightly too if it's not of a totally neutral colour, which is unlikely. 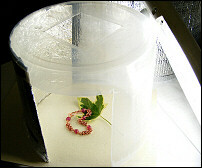 See the photographing small objects page on the blog for more on white balance etc. Even if using a domestic lamp, investing in a daylight bulb might make your colour woes a little easier. 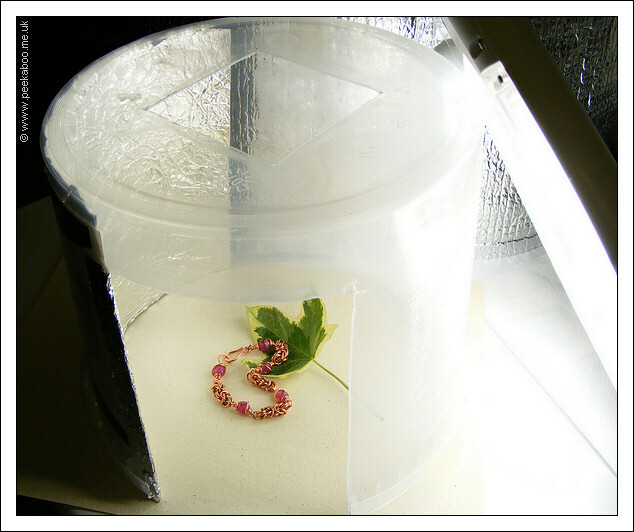 The photographs below were taken with this diffuser arrangement, the first from the side through the cut out panel and the other from overhead through the hole I cut in the base/top. As you can see, you get a really even spread of light, despite only using one lamp - although the ring tube gives more spread light to start with than a single bulb.